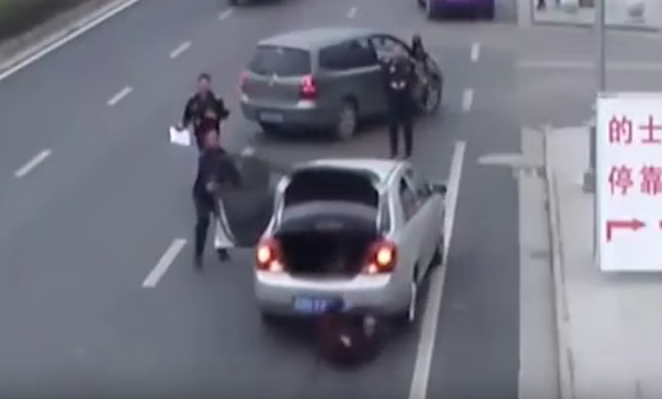 A shocking clip has emerged online of an illegal taxi driver running over his own customer. The video – filmed in Liupanshui, Guizhoi Province, China – was filmed on March 9th, according to People’s Daily Online. Footage shows the traffic authorities stopping the ‘taxi’ for an inspection. The customers then tries to retrieve his luggage from the boot, before being run over as the driver tries to escape. According to local news outlets, the officers had previously been tracking the illegal taxi when they picked up the customer. Somehow, the man only sustained minor injuries in his ordeal, but did lose out on his suitcase as the driver sped off with it. Police later found the suspect and detained him. He reportedly paid 3,800 (£406.50) Yuan for the victim’s medical bills and also received a 10,000 Yuan (£1,070) fine from the traffic police. Illegal taxis are unfortunately pretty common in China and authorities face an uphill battle on cracking down on this illicit trade.